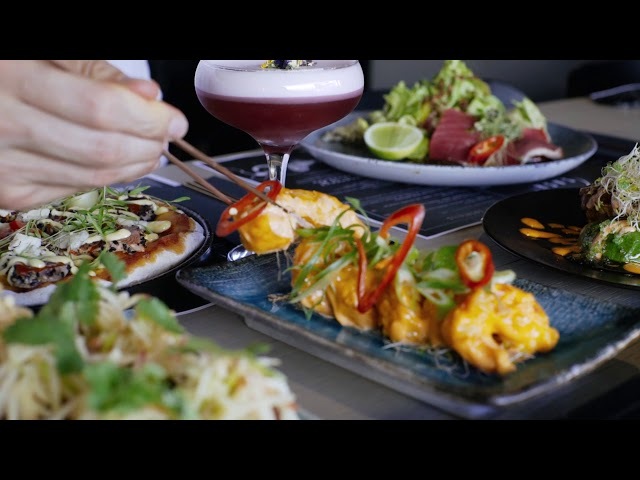 Sash is a new age Japanese Fusion that blends together your favourite dishes from around the globe, with a Hawaiian-Peruvian Japanese influence. Our unique food items include our Japanese style pizza, nachos, tacos, sliders, meats and desserts. Our “feed me” option is designed to take you on a dining journey with the chef’s best dishes letting you experience a wide range of our food that can’t be found anywhere else in the world. We also have a Japanese Cocktail Bar serving some of Melbourne’s best cocktails. For the ultimate dining experience we have our ‘Sash Royale’ that blends together the chef’s best food choices with our barman’s favourite cocktails. Sash is a narrow but long venue, stretching over 40m. Our front section is home to our bar and booths, which is perfect for groups from 2-6 guests. Our mid section is better known as ‘Couple’s Lane’ and features amazing wall art by local artist, Steve Cross. And finally our back section features the kitchen responsible for creating the amazing Sash flavours, and a semi-private area which is suitable for 6-34 people. Sash Restaurant has been voted by OpenTable Diners as One of the Best.